Once you go to the trouble of launching a spacecraft, you may be faced with the problem of landing it safely back on Earth or some other astronomical body with an atmosphere. A great deal of effort has gone into perfecting systems to shield spacecraft from the intense heat generated by their rapid penetration of an atmosphere. The most intense heat ever experienced by a spacecraft entering a planetary atmosphere happened when the Galileo probe entered the atmosphere of Jupiter. The heat was twice as intense as the surface of the sun. Special lightweight phenolic carbon heat shields made of fibers in resin matrix were used to protect the probe. 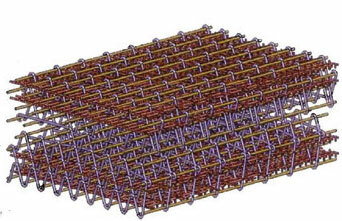 Due to planning for missions to land probes on Saturn and Venus, new heat shielding is under development. These new shields will have to be as heat resistant as the phenolic carbon shields but much lighter than the phenolic carbon shields. NASA in conjunction with private space industry partners is working on a new Heat-shield for Extreme Entry Environment Technology (HEEET) system. In 2013, the Planetary Science Division and the Space Technology Mission Directorate’s Game Changing Development (GCD) Program at NASA jointly funded an initial study that lasted a year. In 2014, NASA's Science Mission Directorate and Space Technology Mission Directorate formally funded a four year program to work on the development of the new HEEET. Bally Ribbon Mills in Bally, PA and Fiber Materials Inc in Biddeford, MA. are the private space industry partners in the HEEET project. The HEEET system is based on three-dimensional weaving techniques developed to manufacture carbon composite parts for airplanes. Instead of just bonding layers of two dimensionally woven carbon fibers with resin, the new technique weaves together the two-dimensional layers in the third dimension. Fibers of different composition in yarns of different density are woven together and then infused with resin to bond the fiber matrix together. The NASA scientists have created alternative versions of their new HEEET ablative thermal protection system (TPS) and tested them for many different entry conditions. Depending on the specifics of the mission design, the peak heat-flux possible on a Saturn or Venus mission could be as great as ten thousand watts per square centimeter. The peak pressure could rise as high as ten times the average atmospheric pressure at sea level on Earth. The new HEEET woven material will be able to withstand these conditions while being much lighter existing phenolic carbon heat shielding. In addition to these superior qualities, the woven nature of the HEEET materials will also increase the mechanical strength of the heat shield. In 2015, the HEEET team demonstrated the ability to form and infuse with resin a spherical heat shield tile cap of standard design. Current plans call for the HEEET project to delivery technology that can be included in the planning and design stages of new missions.